In no particular order (well, OK the first three are close to my heart!) 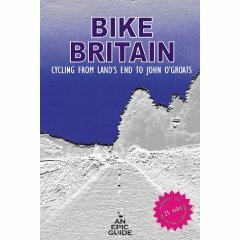 this is a listing of books about riding the End-to-End in the UK together with some other books and mapping resources. There are others . . . I'll add more in due course. Rob & Joe's JOGLE, 2005 - No 176 in the Library of Journals - the Journal, the researched routes we considered and a complete, marked route map (as Word & pdf documents) is available on a DVD/CD for a donation - order from the ONLINE SHOP. There is also another DVD/CD of Rob & Jon's LEJOG - the story of the 2010 ride, including .gpx files for GPS users. A handy guidebook describing a 14-day End to End cycle route from Land's End to John o' Groats (LEJOG), largely on minor roads and cycle paths, with detailed maps, profiles, all key grid refs and GPX files. Also full listings of accommodation providers, tourist information offices and bike shops as well as tips for first-time cycle tourers. This handy pocket guidebook offers a detailed route description of an End to End cycle route from Land's End to John o' Groats, with over 350 OS grid refs included for GPS navigation. It is divided into 14 stages and contains information on where to stay, with full details of numerous B&Bs, campsites, cycle shops, small hotels, tourist information offices and hostels. The route has been designed to avoid the busier A roads as much as possible and follow minor roads and cycle paths. It also takes in some of the best landscapes of Britain from Dartmoor, the Wye Valley and the Welsh Marches, the Forest of Bowland, the Lake District through to the glorious Strathnaver Trail and the rugged coast of Caithness. Descriptions of key landmarks along the route are also included, from Tintern Abbey through to the Forth and Clyde Canal in Glasgow and beyond. Land's End to John O'Groats is Britain's classic long-distance cycle tour. This route, from the south-west tip of England to the north-east tip of Scotland, follows mostly quieter roads and incorporates some of Britain's most beautiful and interesting areas: the Cornish coast, the Roman towns of Bath and Chester, the Lake District and Scotland's tussock covered Highlands and brooding lochs. Whether cyclists are planning a short county to county jaunt, or a tip to tip epic, they will find this unique guide valuable. The volume features: the best times to go and what to take; detailed route descriptions, including historic and geographic data; strip maps, elevation profiles and GPS points along the route; hotel, B&B, hostel and camping ground listings; and information centres and bicycle shops. This book was out of print but is now available again ... the following is a review from Amazon Books (from 1999), I have to agree that it was pretty poor. The more recent version appears to be an improvement. "I must admit, the introduction was by the far the best nine pages included in this book. I shared all of the author's 'dreams' covered within the introduction, only to be lead into a second rate history of Great Britain. Each of the towns/cities visited along the way were given a BRIEF historic review, not particularly relevant to the touring cyclist embarking on this mammoth trek. The maps were a little confusing and one must ask oneself if using two different shades of red for routes and major highways was a wise choice. Overall I have come to the conclusion that there was not enough relevant information in this text"
Route description of a 910-mile route using A-roads for the fastest route with short selection of maps of difficult towns to navigate. Advice on what to take. Limited accomodation information. Reviews on Amazon for this book are for the most part critical of the value and usefulness of this book, even for the latest (2009) edition. I have to say I would agree. Not just the E2E but lots of other routes too. The details are comprehensive but in common with most Lonely Planet books this one has an awful lot of the content taken up with general information about the country to pad it out. The CTC End to End pack has 3 routes and is free to CTC members. Non-members can buy the Pack for £12.50. The "pack" consists of sheets containing three photo-copied routes of varying detail and usefulness.